Tim Eian is featured in this article on sustainability in Minneapolis’ Northeaster. Our Passive House in the Woods is part of an article in today’s Wall Street Journal on zero energy homes. The article is called “Stealthy Green Homes“. Recently we were interviewed by Remodeling Magazine about our EnerPHit project in South Minneapolis. This project is a pilot EnerPHit project our office designed. Certification is in progress with the Passivhaus Institute in Darmstadt, Germany. We were fortunate to be asked to display some of our work at the Das Haus Exhibit in Chicago, which is ongoing at the moment. Our colleague Mark Miller was kind enough to record the project posters in place on Daley Plaza with his phone. If you are in the area, make sure to check it out in person. We’ll showcase some of them at this year’s annual North American Passive House Conference in Denver this week, as well. Our studio was recently featured in an article on the Graphisoft BIM Engine Blog. Scott Gibson on Greenbuildingadvisor.com was kind enough to review this blog on his blog. You may find the article at this link. Thanks Scott! 05/14/2011: Jetson Green published an article on the Synergy Concept: Synergy, a Beacon of Passive House. The Minneapolis Examiner published an article by Shengyin Xu about the Passive House in the Woods project yesterday. It’s a great primer on Passive House and it highlights some of the key features of the Passive House in the Woods very well. Read. Corey Gaffer posted a series of photos and an animation of the Passive House in the Woods on his blog. Nice work Corey! The Daily Reporter posted a brief article about the Passive House in the Woods project. Read it here. The Hudson Star Observer followed up with Gary Konkol this week to see how he’s doing in the house without furnace. Read the entire article here. I’d like to add that $25.25 of Dr. Konkol’s electricity bill goes to the service fees, which means the actual cost of electricity consumed in November was only about $35. It will be interesting to track this over a year and report back an average, since these winter months are going to be more energy intensive than the swing seasons and the summer. In addition, November was incredibly cloudy in the Town of Hudson, leading to very little energy production. And before I forget to mention it—the electricity bill is the only utility bill at the house, so the $35 included the entire energy purchase for heating, ventilation, hot water, and household electricity. The Star Tribune printed an article today about the Passive House in the Woods project: “Solar Powerhouse“. The Passive House in the Woods project is featured in the Fall/Winter 2010 issue of Remodeling Today Magazine: “An Extreme Eco-Friendly Home”. 11/11/2010: Eco Home Magazine published an article about the Passive House Alliance, mentioning the Passive House in the Woods project, as well as the 7th international Passive House Days event that we are participating in. Mary James at Lowcarbonproductions just published her second book on Passive Houses in the U.S. called “Recreating the American Home”. I am happy to announce that the Passive House in the Woods project is one of the feature projects in the book. You can find more info and purchase the book here. Metro Magazine listed the Passive House in the Woods as number 34 on their Metro Top 100 list. MPR picked up on the Passive House in the Woods and conducted an interview with Gary Konkol, the owner. You can also find the interview on MPR’s website. Metro Hippie aka Josh Foss put up a blog post about his recent visit to the Passive House in the Woods project. You can find it at this link. The Passive House in the Woods project was just written up by the local Hudson Star Observer: “North Hudson man takes building ‘green’ to a new level”. Green Builder Magazine featured the Passive House in the Woods project in its March issue in the Green Scene section. Thanks for the tip Josh. 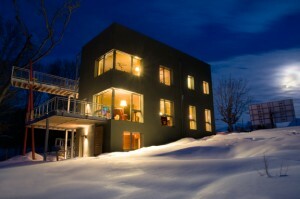 Jetson Green posted this wonderful article about the Passive House in the Woods today. The Passive House in the Woods project is currently featured in the spring edition of Minneapolis/St. Paul Magazine in the “Buzz” section: “Zero Footprint”. Here is the link to the Merriam-Webster website entry. On that note, remember that Passive House building energy standard creates buildings with the lowest certified carbon footprint (for operation) in the world.